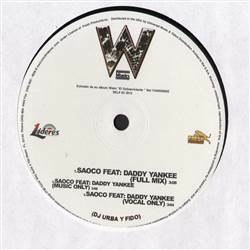 REGGAE, Lideres Entertainment, USA, 2004... Reggaeton with Saoco feat. Daddy Yankee (Full Mix), Saoco (Music Only), Saoco (Vocal Only). Tracks repeat on both sides. Mary J. Blige / Shai / Geto Boys / Das EFX / Michael Jackson / Fu-Schnickens - Untitled (Reggae Blends) 12" Steve Flex - Running Man 12" Chaka Demus & Pliers - Mr. Mention 12" Gregory Isaacs - Tribal War 12"
Various - Tiajuana LP Riki Brooks - Wall Come Down 12" Various - Reggae Classics Volume One 12" Lazo - Satisfaction Guaranteed 12"